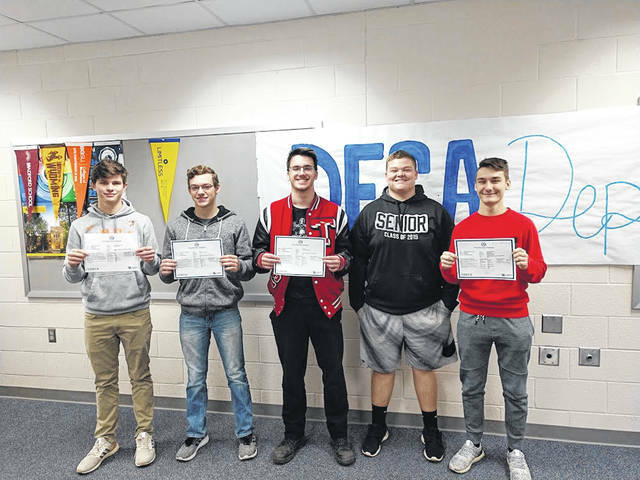 From left are Elijah Carson, Dylan Van Tassel, Jackson Lightle, Josiah Leasure and Kohl Eggleston. NORTH LEWISBURG – Elijah Carson, an Ohio Hi-Point Career Center Triad DECA chapter member, is headed to the DECA International Career Development Conference after he placed first in the state in the Accounting challenge in the Virtual Business Challenge, a nationwide competition. Students around the nation were tasked with multiple business application challenges ranging from personal finance, retail management, hotel management, sports and entertainment management, and forensic accounting. In addition to Carson’s first place win in Ohio, he placed second in the Central Region (upper Midwest of the United States) and 11th nationally. His regional placing qualified him to represent Ohio and the Central Region at the DECA International Career Development Conference in Orlando, Florida, in April. With his qualification to the International Conference, Carson is the first two-time OHP Triad DECA International qualifier. Dylan Van Tassel finished second in the state, third in the Central Region and 16th in the nation in the Personal Finance challenge. Joining Van Tassel in the top five in Ohio were Jackson Lightle, Kohl Eggleston and the team of Josiah Leasure, Klinton Driscoll, and Elijah Carson. The students are enrolled in Ohio Hi-Point’s Supply Chain Management program at Triad High School, under the instruction of J.J. Martin.